OBLHS members and volunteers strive to preserve, protect, and educate. Click here for the latest news! Lighthouse fun & games for kids of all ages! Word searches, coloring pages & more! Great information for teachers as well. T-shirts, books, tote bags & more. North Carolina lighthouses are some of the most recognized in the world. Wear yours proudly! There are several types of lighthouses on the coast of North Carolina, with each serving a different purpose. PEOPLE OF ALL AGES are drawn to lighthouses: some because of their historical significance, some because of their majestic mystique, some for the stories within the walls of the towers, and some seeking spiritual identity. For whatever reason, people from all over the world visit the Outer Banks of North Carolina to see the lighthouses. 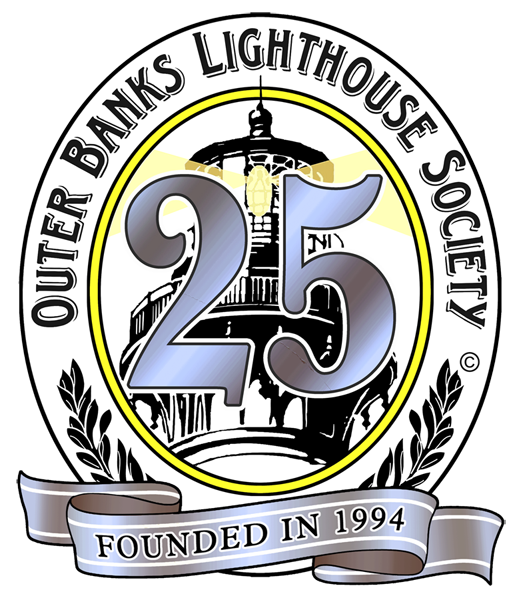 The members of the Outer Banks Lighthouse Society share this interest and a common goal in keeping these lights shining. Come see our lighthouses. They call to us not just across the water but across time. They are markers of history, of navigation, and of our dreams. ENJOY THEM. THEY BELONG TO YOU.